In February CSDA hosted a workshop on impact evaluation for New Zealand government officials. 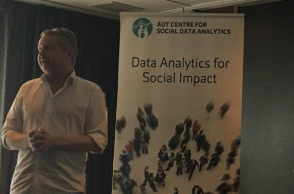 Two Danish scientists led the workshop: Dr Hans Henrik Sievertsen from the Danish National Centre for Social Research and Professor Michael Rosholm from TrygFonden’s Centre for Child Research, Aarhus University. Insights from the researchers were of great interest to the public sector audience because Denmark is seen as a frontrunner when it comes to “walking the talk” those new policies should be based on solid evidence. Michael Rosholm talked through the evolution of evidence-based policy in Denmark, where he has been a key player in arguing for, and delivering, randomised controlled trials for labour market policy. Now that RCT’s are becoming ‘normalised’ in the labour market sector, he and his research team have turned their attention to progressing the same approach to policy in the education and youth sector. Hans Hanrik Sievertsen talked attendees through four popular “quasi-experimental” methods that can be used to evaluate policy, pointing out that while these are often more feasible than the ‘gold standard’ RCTs, they can only be used to answer a limited range of questions.